Choosing the right airless tip contributes greatly to the performance of your sprayer, the quality of the finish and the success of your jobs. Tips control the width of the spray pattern; the paint flow rate; and, ultimately, they tell the pump how hard it should work. For all intents and purposes, tips are the brains of the operation so choose wisely. First, it's important to understand how to read tip sizes. Tip size numbers define two things — fan width and orifice size. They have three digits, and understanding what they mean is a key to choosing the right tip for the job. Let's use a 517 tip as an example. The first digit (5) is multiplied by two for the approximate fan width (10 to 12inches). The second two digits (1 and 7) are the size of the orifice in thousandths (.017), representing the flow rate (i.e., how many gallons per minute will pass through the orifice). The diagram below shows what happens when you change tip sizes. In example A, the three tips have the same fan width. As their orifice sizes increase, a greater volume of paint is applied to the 10-inch area, resulting in more paint per square inch. Example B shows three tips that have the same orifice size (.017). 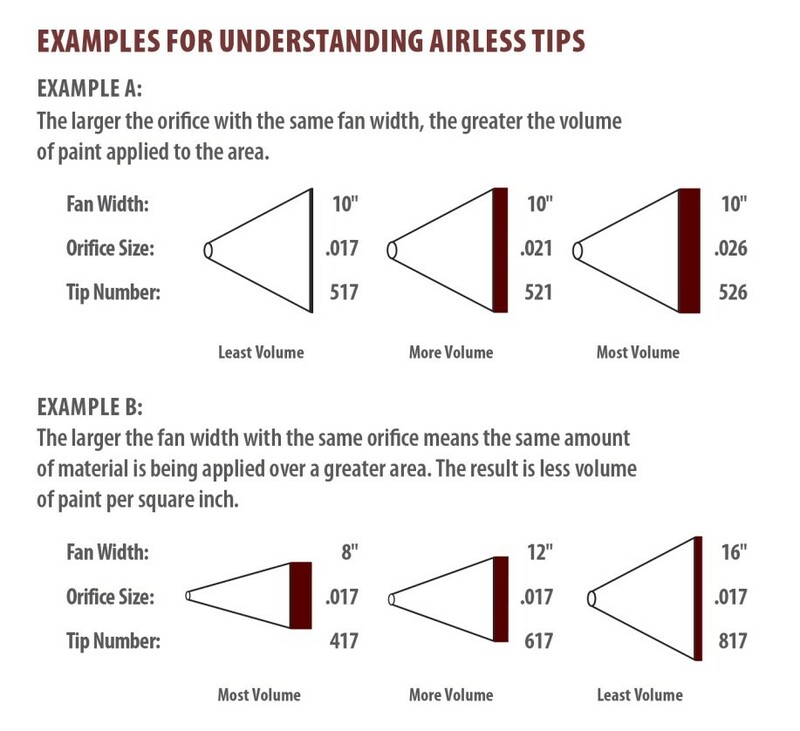 As the tips' fan widths increase, the same amount of paint is applied over a greater area, resulting in less volume of paint applied per square inch as the sizes go up. There are basically two types of tips, reversible and flat, ranging in size from 107 (2- to 4-inch fan width for thin coatings like deck sealers), to 962 (18-inch fan width for heavy coatings like driveway sealers and roof coatings). Flat tips were the first tips to enter the market and are most often used for spraying thin coatings like lacquer, enamels and stains. They can also be used to spray heavier coatings when a supplemental filtration system is being used with the sprayer. There's a good reason for the filtration system. While flat tips are less expensive than reversible tips, it takes more effort to remove blockages when the paint has imperfections or particles of sand or dirt enter the system. Reversible tips are designed for ease of use, and supplemental filtration systems aren't required. Here's how they work: When in spraying mode, the tip is facing forward. When a blockage enters the system, you reverse the tip by turning it 180 degrees, pull the trigger to spray the blockage out, then turn the tip back 180 degrees and continue working. 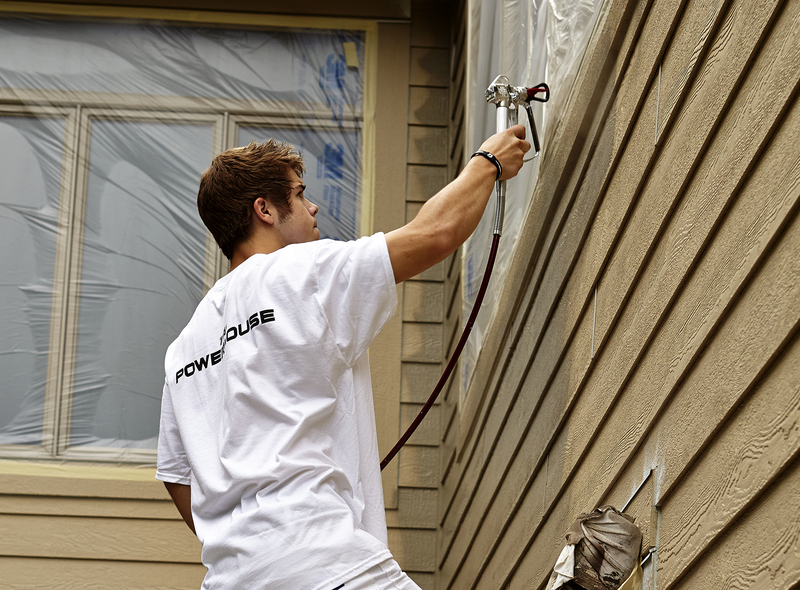 There are several grades of reversible tips for residential and commercial painting (premium, versatile, value), and there are specialty reversible tips for high-pressure high-viscosity coatings, as well as for fine finishing. Flat and reversible tips wear about the same, and their gallons-per-minute (GPM sprayed are about the same). The choice between a flat or reversible tip will depend on what coatings you spray, whether or not you want to use a filtration system, and how much you want to spend. Fan width: For large surfaces, like walls and ceilings, you'll want a larger fan width for wider coverage of the area (8 to 24 inches). For smaller surfaces — like deck boards, cabinets and fences — you'll want a smaller fan width (2 to 8 inches). Orifice size: Generally, when the coating is thin, you'll want a smaller orifice. When the coating is thick, you'll want a larger orifice. 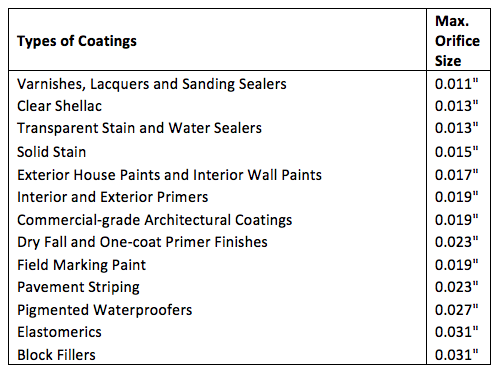 Below are recommended orifice sizes for various types of coatings, based on a typical 12-inch distance from the surface with an 8- to 12-inch fan width. 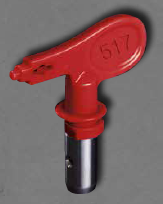 Most paint and coating manufacturers include recommended orifice sizes on the technical data sheets for their products. Look for them on the paint can or on the manufacturer's website. In closing, the mil. thickness of the coating you're applying will depend on the flow rate and the speed at which your hand is moving. If your hand moves fast, the mil. thickness will be less than if your hand moves slow. That being said, you can compensate for your hand speed by using tips with different flow rates, or GPM rating. By using a tip with a larger orifice, you can spray faster and achieve the same mil. thickness. For instance, a .017 tip sprays .31 GPM; a .019 tip sprays .40 GPM; and a .021 tip sprays just under half-a-gallon a minute, or .47 GPM. So, with the same hand speed, a 517, 520 and 521 tip will produce the same mil. thickness. Tips really are the brains of the spraying operation so, by applying this knowledge, you can complete jobs faster and with better results — and save time and money, too.